Emily enrolled in creative movement class when she was four. She transitioned to jazz and then to hip hop. In 2015, Emily started musical theater and fell in love. She just finished her 4th production, “The Lion King”, this past spring. She is also is involved with her school orchestra (cello) and the choir group. Allyson started creative movement at age three. She has since moved on to jazz and ballet. Allyson also enjoys singing with her school choir, “Na Leo Menehune” and playing soccer. Allyson has recently started piano lessons. Volunteering as a backstage parent has given Jeannette a deeper understanding for the all the hard work that goes into each production. The performances have shown Emily and Allyson the the value of teamwork and perseverance and provided them the opportunity to grow as individuals. Andy has learned the appropriate times to clap during a show. 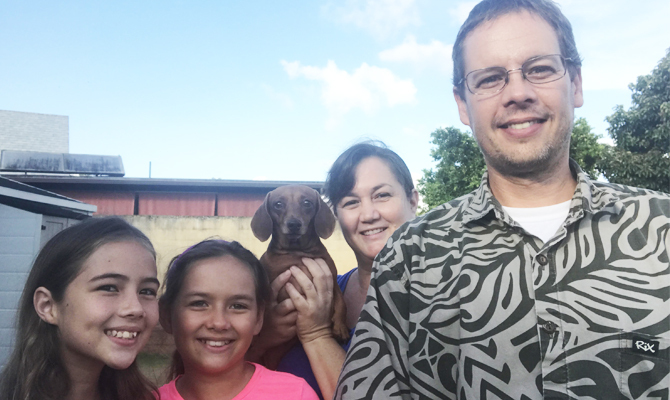 Our family sends a big mahalo to Wendy and Jeremy for providing a wonderful place for our daughters to grow, learn and shine. Our daughters have blossomed over the past few years due to all the support and encouragement of their teachers, mentors and staff.